Since I have a decent amount of yarn still leftover from my Amian bag, I’ve decided to make a few little accessories to go with it. 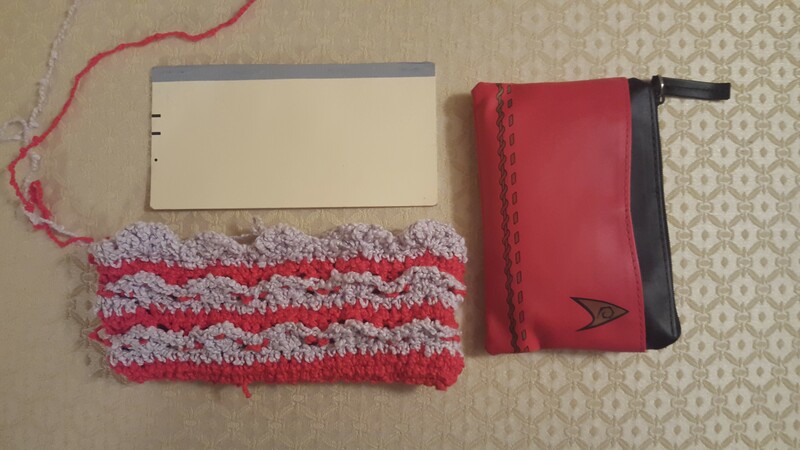 I’ve started off by making a coin purse (so I don’t have to carry my whole purse around). I’m using the same pattern as the Amian bag, but cutting it down to size. Since it’s a simple repeat of 6 stitches, I just have to decide how long I want to make it and then I can do pattern repeats till it gets to the size I want. In the picture you can see it’s wide enough to hold a checkbook (not that I usually carry one around) and it’s a bit wider than my current coin purse so it’ll be able to hold a bit more. And since this is my project bag, I’ll probably also make a case for my double pointed needles (and any other needles or hooks that don’t already have their own case) and I’ll be making a book to hold my scissors, darning needle, and stitch markers that will have a fabric lining with pockets. Anyone have ideas for other accessories I can make with my left over yarn to go with my project bag?